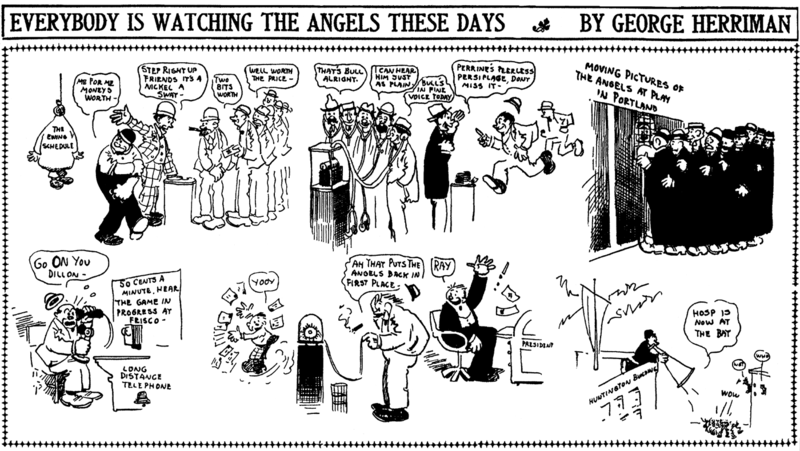 Sunday, May 31 1908 -- Herriman offers up the various ways sports fans could find out what was going on with the L.A. Angels in 1908, if they couldn't attend the game. Fascinating stuff. Going clockwise from top left, we first have an unrelated cartoon complaining about the team's schedule. Then we have a mystery method -- I'm guessing this might be some sort of dedicated phone or telegraphy line of some sort? Then we have motion pictures in the next vignette -- of course those would have been available no earlier than a day or so after the game. Then we have the telephone, which was horrendously expensive, as you can see. Next there is the ticker tape, which was installed in many finance-oriented businesses like banks and stock brokers. Finally there is what seems to be radio -- a very early reference to it, I think. Hello, Allan---The men in picture two are listening to a record. Notice the cylinder? It was a popular way to listen to records at fatrs and dime museums was to put a stethoscope-like device to your ears. ---Many companies that needed up-to-the-minute news, like a newspaper or a gambling parlor (for horseraces and ball games), had ticker-tape machines. Where can we get fatrs? Do they make them anymore? Hello, GRIZEDO----That should read "fairs". Seems I always notice my spelling mistakes after they're carved in granite.